The teacups are stunning! I also have a Bavarian, German US Zone tea set. I love the brownies gluten free, wish I had one with some tea right this minute!! Interesting the X with two dots, I'll look it up. Thank you for hosting yet, another great party at, Tea Cup Tuesday with Martha. Enjoy your week. You are torturing me with those brownie pics...I am so jealous! I really admire your teacup collection, and your teacup knowledge, it is all so interesting to me! Hoping the sun shines bright for you tomorrow! Hugs! Beautiful tea cups! And your brownies look divine...yum! You are talking my kind of tea party! Teal china and chocolate :) Not sure it can get any better. Thanks for sharing these fabulous cups again. Terri's colour again for a lovely and delicious tea! 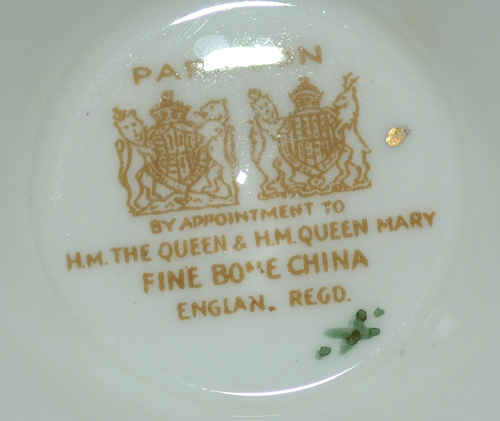 I think the x and two dots on your Paragon cup must be an artist's mark. Thanks for hosting this delightful tea. 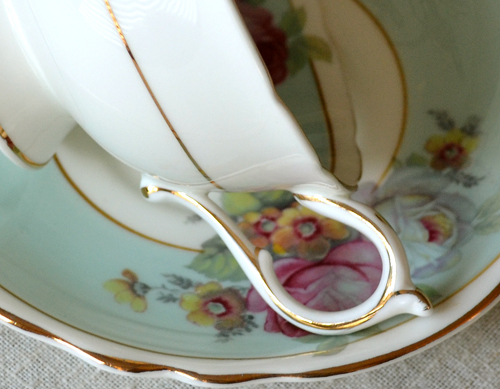 Both of your teacups are just stunning! 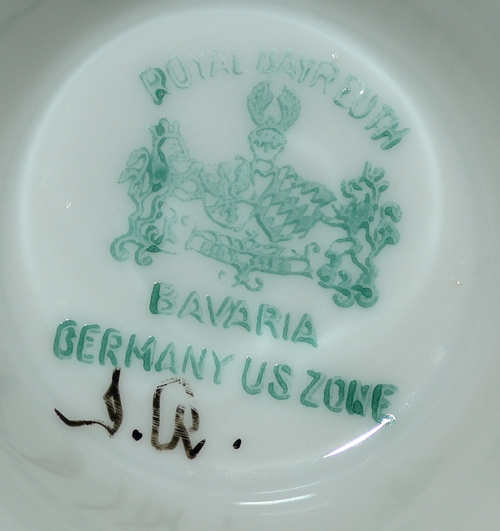 Love the one from Bavaria. Your hubby's brownies look delicious and I could really go for one right now with my cup of tea. Thank you for hosting and have a lovely week. I am in love with your teacups. How beautiful they are! Aqua, being a favourite colour of mine, makes them so very appealing! 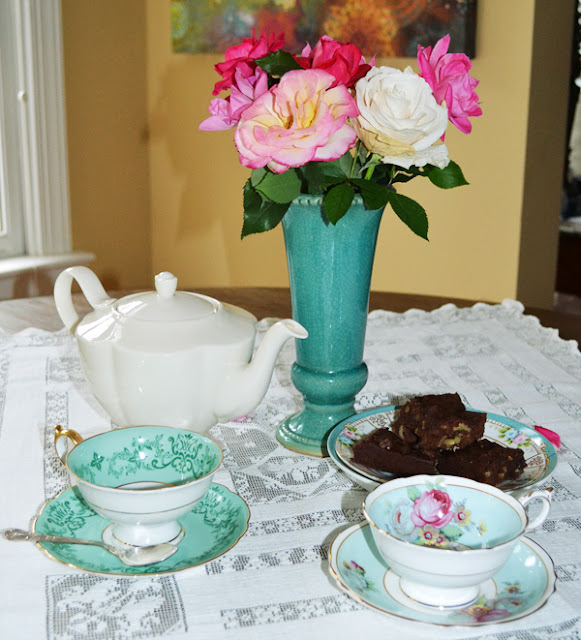 They look stunning set out on your tea table and your hubby's brownies look delish. Have a beautiful day, my friend. Both cups are lovely but the one on the left appeals more to me because of its shade of green. Also, I adore its handle. Those brownies are quite special! Yum, yum! Your husband is a good baker from what I can see. I love your vase, by the way! Hi Terri! I've missed you and all the inspiration you just ooze into Blogland - and my heart - when I visit. I'm in a new season of work and am way out of balance with it's research and writing demands. Working towards getting my life back in some way. Plus - daughter is getting married in a month! Sneaking in to post today after a 6 week absence - feels good but I'm on the clock with students arriving soon!! 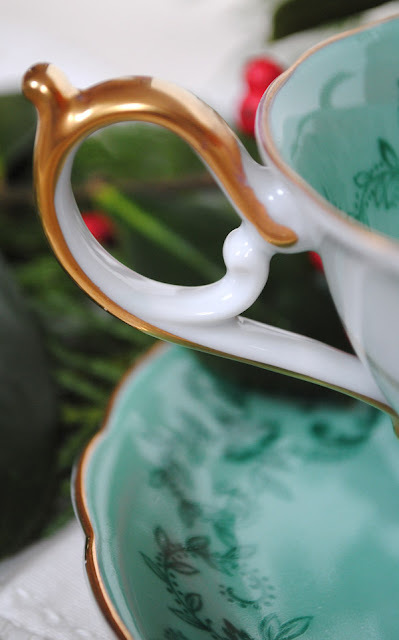 LOVE your teals and blues - I ALWAYS think of you when I come across this color in teacups. So lovely how you show your china off in pictures! And - thanks for saving one of those gluten free brownies - they look delish!! Right up my alley!! Hi Terri...bit late linking up today...had the kids here for a few days! Sigh...miss them already! Love the aqua teacups of course! A lovely setting for a cloudy day. Have a great week! I love the teal color of your cups! Makes me want to go out and buy new teal tea cups. So lovely! Your cups are always beautiful. the colors of your tea table made my heart sung. How I love those aqua colors. There is nothing nicer on cloudy days to see such colors and to enjoy a cup of hot tea. And your brownies look so tempting. Thank you for sharing this delightful teatime and for hosting this sweet event. oh so beautiful!!! lovely teacups!!! and the setting is perfection!!! I love the colors of your teacups...so beautiful. Your brownies look delicious. Thank you for hosting. Have a wonderful week. Hi Terri! Beautiful posts..yummy swweets! Yay..how awesome.. a little sweet birdy came into to shine some magic! Wonderful! The perfect moment! What beautiful teacups! I especially love the one with the roses. 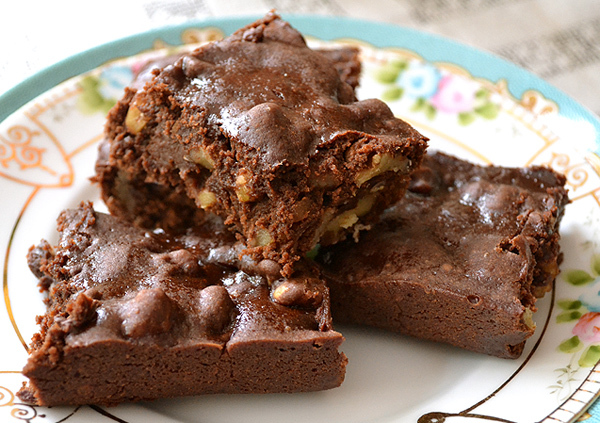 Your brownies look so yummy and would be perfect with a cup of tea! Thank you for hosting your tea party! This post is gorgeous- I love the aqua blue in those pretty cups! The forgotten Garden is a lovely story .Isn´t it? I enjoyed a lot reading it! What a truly beautiful combination of aqua cups and the vase fits so perfectly. I have come back to this post more than once to oooo and ahhhhh.